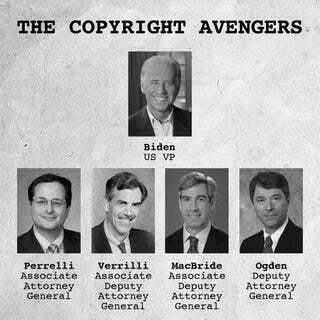 RIAA-fan Biden's influence in the Obama administration may be larger than anticipated, at least when it comes to file sharing: His good pals with RIAA and BSA connections keep getting Department of Justice's seats. According to CNET, "President Obama is continuing to fill the senior ranks of the U.S. Department of Justice with the copyright industry's favorite lawyers" with the selection of Donald Verrilli, from the Verrilli Family, el Señor Presidente's latest acquisition. Verrilli is the guy who shut down Grokster, sued Google on behalf of Viacom, and sued the pants out of Jammie Thomas in the name of the Recording Industry Association of America, that bunch of nice lovely assholes. His new position at the Department of Justice? Associate deputy attorney general. This follows up the naming of Tom Perrelli, from the Perrelli Family, as associate attorney general, the third-in-command post at the DoJ. Perrelli was and probably still is the favorite lawyer of the RIAA, suing people and companies left, right, and center in the name of the recording gang. He will be in charge of the DoJ's civil, antitrust, and civil rights division. But don't go away, because there's more. Who is the deputy attorney general, the second in command at the DoJ, do you ask? Mr. David Ogden, who-according to his previous job's biography-represents "media and Internet industries, as well as major trade and professional associations." He also as "part of the department who successfully defended the Sonny Bono Copyright Term Extension Act before the U.S. Supreme Court." Not enough? Don't worry, because the VP has other friends in other places. Take Neil MacBride, another associate deputy attorney general, who previously was an aide to Biden himself. MacBride was the king of the legal hill at the Business Software Association. As the BSA's antipiracy enforcer and general counsel, MacBride oversaw the creation of the program that rewarded people for phoning tips about suspected software piracy. All these picks follow President Obama's words, announcing that these people "bring the integrity, depth of experience and tenacity that the Department of Justice demands in these uncertain times." It also comes after his words as presidential candidate, asking for less restrictions and less power for the recording industry. Surprised? We are not. After all, there's a pattern here. Mr. Clinton was the one who signed the DMCA. And the president of the RIAA reportedly only contributes to Democratic politicians and causes. Not that the Republicans are any better in this front, mind you. In any case, you know what we think about the recording industry and these issues.